Conservatives cannot design. Except when they can, as in the case of certain late-epoch Trump graphics, assembled by a team led by… Brad Parscale, just named the campaign head for Trump 2020. Kooky fun contradiction! 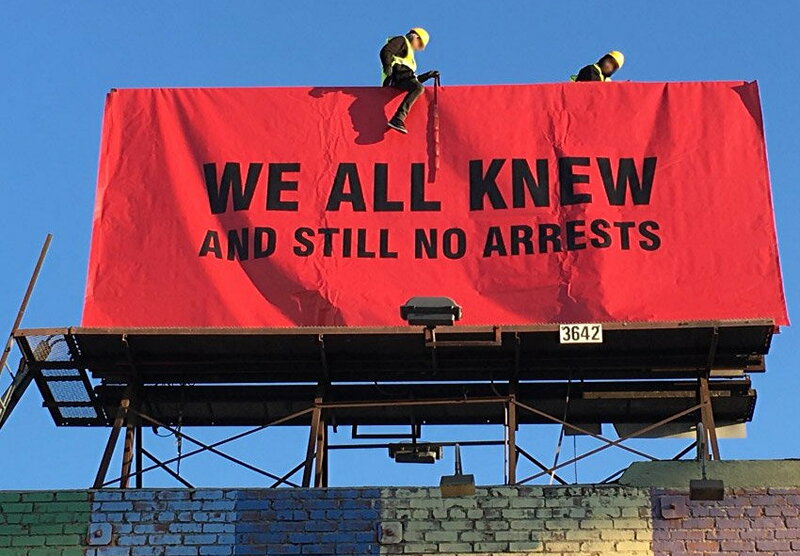 Sabo (a) took direct political action against pedophiles and sexual predators in Hollywood (b) using only text on a solid background. Rather like what (a) ACT UP and (b) Babs Kruger have done since time immemorial, at least in form. It is only the ruling caste, alert to every visual detail, that will act wilfully blind and pretend Sabo’s agitprop is in some respect “right-wing.” Then again, only right-wingers consistently denounce pedophiles. I dearly love Mr. MICHAEL BIERUT [(q.v. ), whose name the New Yorker misspelled] of caste-governing design colossus Pentagram. Michael posted a link to my treatise on conservative design, but there’s no link to that link because mighty Design Observer still cannot figure out basic HTML (nor ever could). But that’s all Michael is willing to do. His Design Observer runs the gamut of observations from A to B . Michael even waited several months until – again – the New Yorker conferred its imprimatur on Sean Tejaratchi (q.v.) before mentioning the latter on the (Design) Observatory podcast, cohosted with a Sontag manquée for whom “insufferable,” “enraging,” and “unlistenable” are preposterously inadequate sobriquets. This is graphic design. We’re all on the same team, and there’s only ever been one.